I’ve finished stage 1: the UI stat dictionary is no more. All data is now coming from a single, ridiculously complicated source. It works, though. Pretty much all the important stat data is now coming from the StatData definition class. This is a good thing. 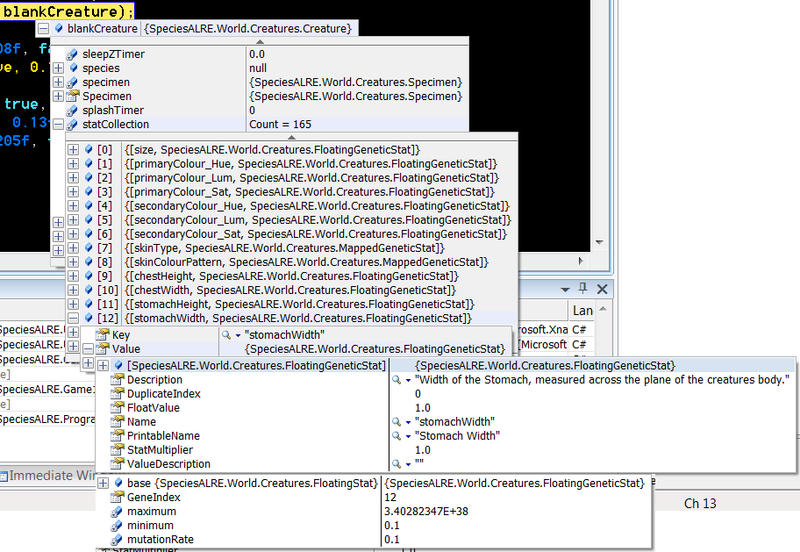 Here’s a copy of the source code for the StatData class’s constructor. In it’s current state, it includes the complete definition for all the stats, including the delegates that actually calculate quite a few higher-level stats. Things like speed, stamina and attack damage: the complete formula for them are all here. It’s still functionally identical to what’s running in 0.8.0: some syntax and text changes, but nothing that actually changes how the simulation behaves. So you can compare it to the actual game, if you so desire. The second stage is supposed to be softcoding the entire UI, but… well, that’s looking more complicated than initially expected. … other control definitions are… less simple. I could import definitions as strings rather than numbers, with tokens like [SCREENWIDTH] being replaced by variables in the interpreter. I could try to replicate all this functionality with a data-driven system (using anchors, for example), rather than an algorithmic one. I could try to store these values as a node/variable in XML (I think that’s a thing you can do. Really not as familiar as I should be with XML). … or I could just… not. The investment is turning out to be larger than I’d originally planned, and although I’d still love to softcode the entire UI for modding purposes, is it really worth it if it takes a few months extra to do so? 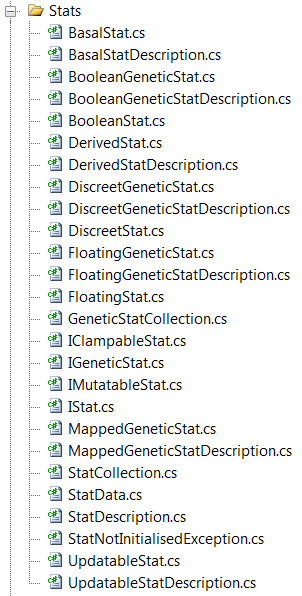 The alternative is just doing a more general clean up on the whole thing, while keeping it contained in C# files. I’m really not sure if this is a better option or not. Luckily, I’ve got another feature I’ve decided to play with while I decide what I’m going to do here, so I can at least postpone that decision while I consider it. This entry was posted on July 28, 2015, 10:01 am and is filed under Uncategorized. You can follow any responses to this entry through RSS 2.0. You can leave a response, or trackback from your own site. Aye. WordPress only has a limited number of file types it’ll allow me to upload here, and I was too lazy to visit mediafire, so I copy/paste’d it into a .doc document. Does this fix the clade diagram corruption thing? Will there ever be a Mac version? Working on it. Some sort of php vendor update screwed everything up.